How much will the evolving landscape of AI impact content creation? I had a conversation with BuzzSumo co-founder Steve Rayson who said writing algorithms are available for purchase, have been bought, and are in use by major platforms. And, they are creating well-written, data-backed articles, he said. I was surprised. I knew the AI landscape was evolving in the industry: But just how much would it really affect content creation? I took a data-driven look at the reality. How much has AI been implemented behind the scenes for content creation? And what does this technology cost? 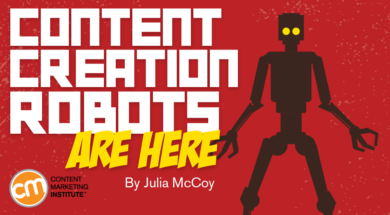 The key phrases behind content-writing robots you’ll see a lot – intelligent narratives, natural language generation (NLG), and automated storytelling technology. Now, let’s meet the writing AIs behind three leading publications. The biggest player in the content AI field could truly be Narrative Science, which created NLG software called Quill. Narrative Science started in 2010 as a Northwestern University experiment turning baseball box scores into traditional stories. In 2011, it raised over $6 million to study the landscape of how to create “human-free stories” (such an oxymoron to say). In 2013, it raised another $11.5 million for further development. Today, Quill can generate news stories, industry reports, and even headlines without human intervention. It’s limited to the confines of news reports and data-backed content, but it can generate that type of content at scale. Narrative Science “rents” Quill mostly to financial clients for whom it can create 10- to 15-page financial reports in a matter of moments (what would take a writer possibly weeks to put together). MIT Technology Review reports Quill is churning out over a million words a day. It creates content for clients like Groupon, Forbes, T. Rowe Price, Credit Suisse, and USAA. Client companies can inform Quill of the style of language, tone, and angle to use. That goes beyond what much automated content software has been able to do. For example, if an audience is known to love a certain team, Quill can write a story that softens the blow when that team loses. Crazy! The energy sector was the main contributor to relative performance, led by stock selection in energy equipment and services companies. In terms of individual contributors, a position in energy equipment and services company Oceaneering International was the largest contributor to returns. Stock selection also contributed to relative results in the health care sector. Positioning in health care equipment and supplies industry helped most. Though Narrative Science doesn’t publish pricing for Quill, I looked at Quora where one person reported a tier pricing system and shared numbers that were in the ballpark of what a few people in the industry confirmed to me. Pricing is based on story types. One story type – one interpretation of one dataset – could generate up to 100,000 stories and cost $70,000 a year. While three story types would be $175,000 a year. In the past year, The Washington Post has published more than 850 stories created by its in-house automated storytelling technology called Heliograf – although, more realistically, it may be better named in-house reporting technology because it churns out news articles and social media posts. Other content was complete stories. (Again, “story” is a stretch – it’s more the style of a journalistic report). Heliograf supplemented The Washington Post reporters covering the Rio Olympics, and created 300 news stories and alerts for the event. The Post also has used Heliograf to cover hundreds of political races. Today, The Washington Post sells Heliograf’s technology through Arc Publishing, which starts at $10,000 a month and can increase to over $150,000 a month. And, The Wall Street Journal reports, the CIO has said that the profitability is astronomical – 60 to 80% margins. HANDPICKED RELATED CONTENT: Should You Trust Artificial Intelligence to Drive Your Content Marketing? The Associated Press, one of the nation’s oldest news networks, was founded in 1846 when five newspapers from New York City funded a pony express-type route to bring news of the Mexican war faster than the U.S. Post Office could. It’s crazy to think that today robots are writing thousands of the AP’s news stories. 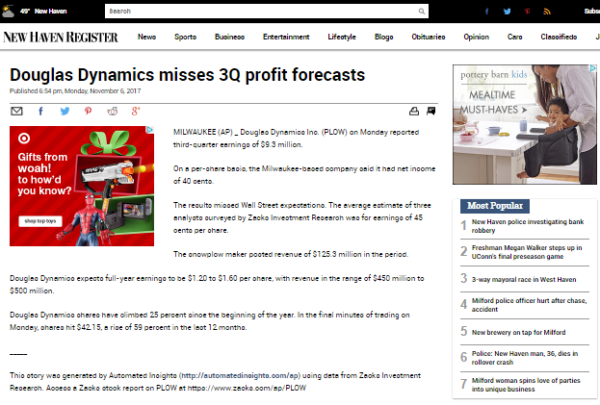 The AP saw Automated Insights as an answer to combat the low output of corporate earnings reports by its writers. With the AI technology, output increased by 12 times. With the help of Automated Insights, AP now produces 3,700 quarterly earnings stories, which are brief. Here’s an example. Automated Insights could hold the very keys to the castle for making content robots accessible to everyone, including B2B companies and small to medium-size businesses. Here’s why. Automated Insights has gone on to create an insanely smart content robot, Wordsmith, which it calls “the world’s first public natural language generation platform.” The catch? A lot of human content work is required for the algorithm to work. Add your data to the software (tell it a few data points for a “story”). Write a template for the story. Preview the output of the NLG software and edit it. Publish your half-robot/half-human-created story (yes, straight from the app). “Bad news, homeowners. In the last month, home prices in Phoenix Metro Area have fallen. Overall, 3,214 houses were sold in Phoenix over the last 30 days, with Phoenix County leading the way with 3,032 sales. Potential buyers take note: the median sale price in Phoenix fell to $424,000, while the available housing inventory rose. There are now 3 months of home inventory left in Phoenix. That’s darn good copy for a bot. The writing skills are basic, thus an experienced journalist could put it into better context – to tell a more effective story. The direction of Wordsmith – a mutation of bot and human – could be a direction for marketers. Hundreds of businesses have invested in using Wordsmith, including Allstate, Microsoft, and Yahoo! The software generates over 1.5 billion pieces of content per year. Plus, it can develop content in more than 20 languages. That’s not even the crazy part yet. The API is “milli-second” fast. You read that right. It can generate content in seconds what would take a team of writers possibly weeks to develop. Access to Wordsmith starts at $2,000 a month with an annual contract. Managed services, which are recommended, are an additional fee. Set-up costs for each story’s data points also are an additional charge. Is your mind blown yet about content AI? There are more content robots on the scene. The Los Angeles Times created the QuakeBot, which writes stories when it picks up data from the U.S. Geological Survey after an earthquake happens. The robot even has its own Twitter handle. Automated Insights shares a case study of a brand using its AI to create content. DigitalSTROM is a smart home system that can program your electronics to follow your patterns of life – coffee made for you before you get up, lights turned on when your alarm goes off, or thermostat turned up shortly before you’re scheduled to come home from work. DigitalSTROM turned to writing algorithms to produce custom, engaging in-app reports for users, and even to construct email communication sent to users. Working with a customized version of Wordsmith to produce a natural language generation-based API, it plugged the API into its app to create customized, original on-demand reports for customers, using variables and rules they set up beforehand. 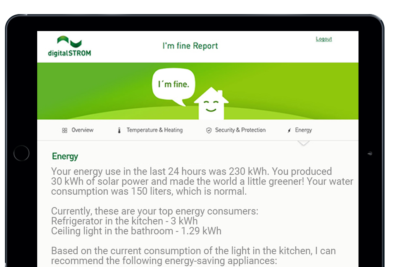 For instance, customers would ask the app about their home energy usage data for the last 24 hours, and Wordsmith would produce a well-read narrative from digitalSTROM’s data. Automated Insights also says its Wordsmith tool can replace the monotony of research and structured data compilation that a human would have to do in the content creation process. For instance, data-rich content production like trend reports and market summaries can now be done by the data-driven writing software. Feed Wordsmith the data about a trend, market, or even the performance of a campaign, and the software can create a well-written report, original, and readable. 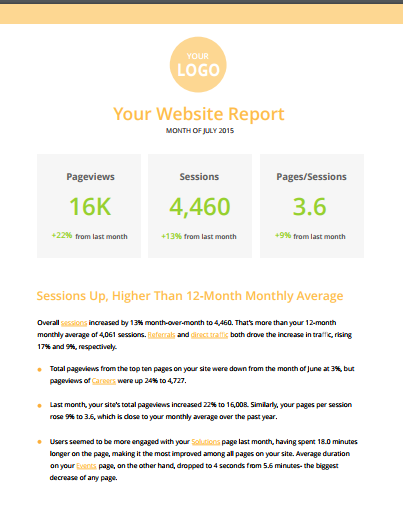 With this type of content creation, marketers can spend more time being creative than digging through rows and columns of figures to get an income report done. Today, it’s fairly easy to integrate AI content creation into your content marketing – think of the above metrics and how much monotonous research work AI can cut from the creation process. Want to get smarter about how to use intelligent content in your content marketing? Plan today to attend the Intelligent Content Conference March 20-22 in Las Vegas.